31st Oct 2012 would be a historic day for Malaysia financial planning industry with the launching of newly formed Association of Financial Advisers (AFA) at Lanai Kijang, Bank Negara Malaysia. From now onwards, AFA will effectively represent all the Licensed Financial Advisers and Corporate Unit Trust Advisers (CUTA) Firms. The association is approved by Registrar of Societies on the 16th August 2012 with the support from Bank Negara Malaysia. In conjunction with its launching, AFA also held its inaugural financial advisers conference titled “Charting New Frontier – FA the Future”. During the conference, audiences were empowered with up to date practices by Bank Negara and Securities Commission. Then, an interesting forum on the Future of Malaysia Financial Advisers Industry was discussed with everyone attentions. How we benchmark ourselves with other countries? We heard some success stories from Singapore and Hong Kong. It was a successful milestone event for financial planners and CUTAs judging by the numbers of financial practitioners who attend the event. Product manufacturers, such as insurance and unit trust companies, started to realize the potential influences of financial planners and CUTAs in distributing their products and services. This signifies the bright future of financial planning industry moving forward, in line with the Capital Master Plan 2 by Securities Commission of Malaysia. There is no better time to be a licensed financial planner now. Still remember one fund called AmDynamic Bond fund? If yes, you definitely knew the superb performance of that bond fund, which had became the flagship fund for AmMutual for past years. However, it was sad that, since few months ago, no more subscription was being allowed for AmDynamic Bond fund because it has reached the maximum limit set by regulators. In other words, too hot the demand for that fund. Then how? Because of that reason, AmMutual is proud to launch another new fund, AmTactical Bond fund, which was managed by using the same strategy, but with a little bit more flexibility. The Fund aims to provide income and to a lesser extent capital appreciation by investing primarily in bonds. The Return of a Pay TV Giant!!! Astro Malaysia Holdings (AMH) is poised to list on Bursa's Main Market on 19th Oct with a market cap of RM15.6bil. The largest pay-TV operator in Malaysia has a de factor monopoly, commanding a 99% market share. Are you excited, again? AMH is the leading media entertainment group in Malaysia with 3,100,000 customers and one of the largest in South East Asia. It is primarily engaged in the creation, aggregation and distribution of content over multiple delivery platforms including TV, radio, publications and digital media within Malaysia. What's the different from the then delisted entity? Just another new fund from TA Investment Management (TAIM)? Think again... In fact, this is the first bond fund launched by TAIM and it will take on the other bond funds in the market with a "Wow" effect. Why? Believe me, you gonna put this fund into your radar of unit trust investment. And, you will know why after reading this post. The TA Total Return Fixed Income Fund is a feeder fund which invests a minimum of 95% of its NAV into the PIMCO Funds: Global Investors Series plc - Total Return Bond Fund (SGD Hedged) and the balance in liquid assets. What? PIMCO !!! Yup, it's the leading global investment management firm, especially on fixed income investment. 5 Reasons Why you should invest into this Fund? Should we learn from Robert Kiyosaki from now on? When news broke out that "Rich Dad, Poor Dad now a Bankrupt Dad", everyone was so excited to share it out to their circles of friends. Maybe thanks to the interesting news title created to attract the attention of us. In fact, it succeed (because it reaches Finance Malaysia attention now). Well, since we're a financial related blog, we must blog about this hyped news without second thought. Should we learn from Robert Kiyosaki from now on? According to UK dailymail, "the financial guru behind New York Times bestseller Rich Dad, Poor Dad has filed for bankruptcy on one of his companies after losing a $24 million judgement." Read carefully... It's on one of his companies, not under his own name. 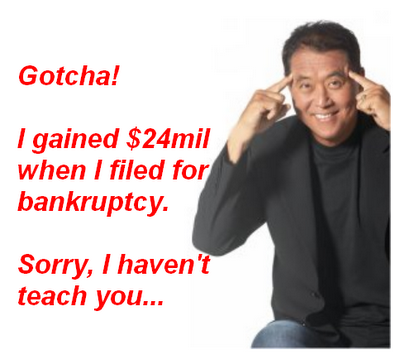 Meaning, Robert Kiyosaki didn't bankrupt. Then, what's the difference? 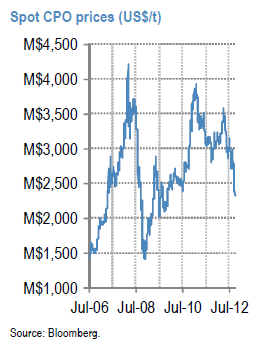 While CPO prices have declined 20% over the past one-month to M$2,300/t, share prices of our upstream plantation universe have not reacted materially moving by -8% to +3% (-3% to +3% for our top picks) Key question hence is whether this raises the risk of a further sell-off in plantation stocks or will CPO prices recover? 1) High inventory levels amid the current high output season. 2) Some easing in demand (though not materially) mainly from slower bio-diesel production. 3) Softening crude oil prices. 4) Better soybean supply prospects with improved weather. Will CPO prices weaken further? RHB research institute (RHBRI) is of the view that it could still be a choppy few months for the equity market in the 4Q given weakening economic fundamentals in the major world economies and fears of an imminent general election on the home front. Whilst more rounds of quantitative easing have been unveiled in the developed world, the big question in investors’ minds is how all these quantitative easing measures will translate to better global economic outlook. Having said that, equity still stands up vis-a-vis the unappealing returns of the alternative asset classes, such as cash and bonds and any good news is still likely to prompt a rally in equities. And, what's the strategy now? In view of current uncertainties still lingering around investment universe, bond was considered as one of the asset class that most investors seeks to preserved their asset value, albeit lower risk. Just as the name of the fund, it's a flexible bond fund which has an interesting early repayment features. Let's have a look. The Fund is a 3-year close-ended bond fund that aims to provide annual income distribution throughout the duration of the fund. To achieve the investment objective, the fund intends to invest its NAV in a portfolio of domestic and/or foreign sovereign issued bonds and corporate bonds. Budget 2013: What's the view by Foreign research houses? 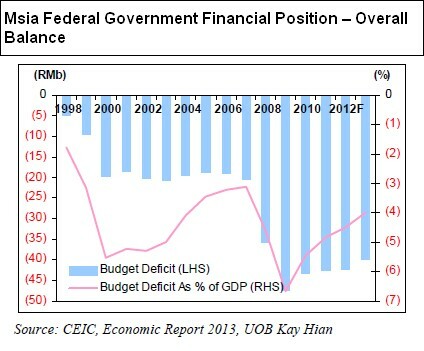 Phillip Capital Management: An earnest & all-around Budget?